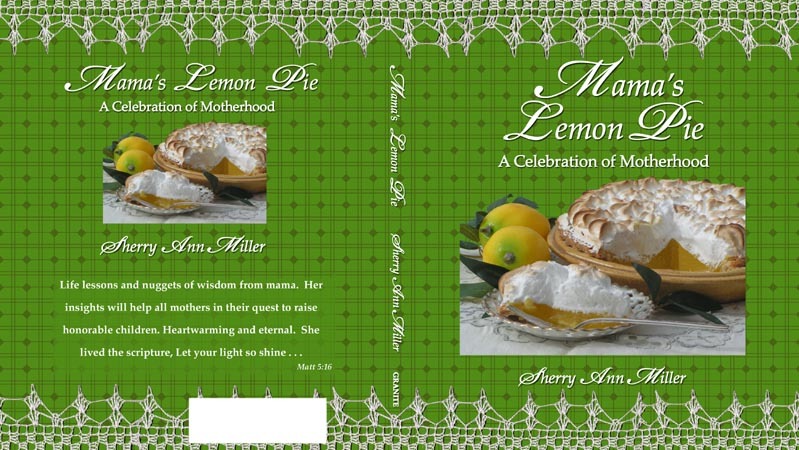 Mama's Lemon Pie, Sherry Ann Miller, "writer of miracles"
The photo above is the booklet's jacket. I am absolutely delighted with the cover! Within the new booklet's pages will be a few extraordinary stories about my mama and the life she led, stories which will not be included on my website. At the back of the book, you will find a place to write down the nuggets of wisdom your mother taught you, a treasured little keepsake to give as a gift, or keep as a special memento. Please look for Mama's Lemon Pie -A Celebration of Motherhood- at your favorite booksellers' in April and May. My publisher is striving to keep the cost under $7.00, which will make it available to almost everyone. It will make a fantastic gift to give your Mother for Mother's Day! In the meantime, this page will continue to be changed periodically with sequential chapters (without those stories found in the Mother's Day booklet). When I add a new chapter to my website, I will remove the previous chapter. Mama is still my inspiration and my best friend. I will always treasure the close bond we eternally share. In the summer of 1953, we moved to an apartment complex where lots of other families lived. Next door, a mean woman watched us from her kitchen window and screamed at us often if she thought we were doing something she didn't like. She ridiculed us and constantly complained to Mama that we children were a "public nuisance!" Once she grabbed my brother, Burke, and shook him so hard I thought his head was going to fall right off, simply because he was playing on the roof of our dog house. This woman always called us names and scolded us severely. Mama asked her repeatedly to leave us children alone, but the woman wouldn't listen. None of the other children in the neighborhood got along with the woman, either. Some of them called her "the old hag," but Mama didn't approve of this name. "Two wrongs don't make a right," Mama counseled us. It took years for us to comprehend that advice, but eventually we caught on. One day the woman, in her biased attempt to thwart our wayward behavior, went too far. She struck my older brother, Lee, right in the face, giving him a black eye. Mama immediately gathered us children together and took us all indoors. But, the woman followed Mama inside our apartment where she yelled and screamed at Mama and at us children. Mama telephoned Pop who came home quickly and demanded that the woman leave our apartment. She refused and Pop had to grab her by both her wrists and drag her out of our apartment. We were not allowed to go outside for several days. Pop went over to the woman's house to talk with her but she threw something at him. No matter how hard Pop and Mama tried to reason with her, she refused to cooperate. She kept yelling that we children were the plague of the earth and should never have been born. Mama cried a lot and we begged her to move us away from there. I remember the term she had counseled us about came up in our conversation. Mama tried to smile, then warned us once again about using labels for people. She gathered us onto her lap sang, "Let us oft speak kind words to each other." A couple of days later on a chilly morning, Mama bundled us up and took us into the city on a big train. It was my first train ride ever. We were excited to watch houses zip past us along the streets. I could hardly count the telephone poles that sped by us so fast! On the trip Mama smiled quietly to herself and I asked her if something special was going to happen. "Today, Sherry, you're going to learn how to make a terrible wrong into a right. When you can't solve a problem by yourself then you ask God for help. You see, when people listen to God they can usually solve their problems. Sometimes you find someone who just won't listen to God, then God will send you to someone else who can help you." When we got off the train, we found ourselves in a big city. We walked for a ways until we came to a tall granite building. Inside and down a long hallway, Mama took us into a court room. A man in a black robe sat up behind a big wooden platform at a desk. There were rows of benches made of a finely-grained wood and I was impressed with the size and luxurious look of the place. I was also surprised to see Pop already at the court room, as well as the woman who had hit my brother. Mama let us sit beside her on a wooden bench. The judge asked Mama to come forward. She warned us to be quiet, but she needn't have said a word about it. Her flashing brown eyes said enough . . . we had already been taught not to "mortify" Mama. She had earlier explained to us about the judge. He was the answer to Mama's prayer, she said, "because he'd been taught how to help make a wrong into a right." When Mama stepped forward, she told the judge about the woman hitting Lee. She said the woman was also mean to Mama's other children. Mama explained how she and Pop had tried to persuade the woman to leave us children alone. Then, she explained how the woman hit Lee in the face. Lee stood up and showed the judge his blackened eye. I believe Lee was only about eight years old at the time. The judge then listened to the woman speak; she ranted and raved about what a nuisance we children were, playing on the sidewalk, running across the grass, making noise early in the morning. Then, the judge listened to Pop as he described his efforts to reason with the woman and his efforts to be a good and a reasonable neighbor to her. After everyone was finished, the judge told the woman that he would issue a peace bond against her. She would never be permitted to touch one of us again . . . nor to verbally abuse us. And if she did, she would go to jail. He was very angry with the woman. I recall thinking that the woman had probably mortified him, something adults just do not like. I felt sort of sorry for the woman and decided Mama was right. We shouldn’t call her an old hag any more, she just didn’t seem to have enough manners, and she was probably not brought up by a kind mother, the way we had. The judge made the woman cry, but she finally agreed to his terms and conditions. Later on, I was glad my parents had gone to court because the old woman moved away and a new family moved in and made friends with us. I have thought of this incident in our lives often as I've grown into womanhood. If our parents hadn't done something to prevent this woman from perpetrating further abuse, one of us children could have been seriously injured. Perhaps more importantly, we learned that childhood is a sacred, special time where innocence is coupled with love and respect. Regardless of the physical abuse the woman dished out upon us, the destruction of a portion of our childhood was something my parents would not tolerate. I've often wondered what Lee must have thought when the woman struck him. He wasn't offending anyone at the time. He was rolling marbles on the sidewalk. The woman didn't care for this "evil practice." But to have slugged an eight year old child? Incredulous! The experience gave us a glimpse of what people can do when they choose to ignore the counsel of God. It must have taken an enormous amount of courage on my parents' part to have sued for a Peace Bond. All their lives they tried to get along with their neighbors. Mama often baked bread and shared her loaves with the less fortunate or sickly around us. I'm sure the incident was one they would have prayed long and hard to avoid. When a parent sees their child absently walk across the street where a speeding car is likely to plow that child down, what parent who truly loves their child would not rush to prevent the accident, knowing that although they may push their child to safety they risk death to themselves? By their living example, Mama and Pop taught us that to protect a child's innocence is ever as important as to protect their lives. Sherry Ann Miller "writer of miracles". Copyright © 10 Jan 2006 by Sherry Ann Miller. All rights reserved.